By CalCom Lobbyist, Yolanda Benson, Government Strategies, Inc. There were numerous changes in the California State Legislature because of elections in November 2018 bringing a supermajority for the Democrats. Leadership in both the Senate and Assembly have made changes to the makeup of the committees, the chairs, and vice-chairs. For the telecommunications industry, here are the changes to the committees of interest. Senate Energy, Utilities and Communications: The chair remains the same Senator Ben Hueso (D-San Diego) and a new Vice-Chair with Senator John Moorlach (R-Costa Mesa). Senate Judiciary: The Chair remains the same with Senator Hannah Beth Jackson (D-Santa Barbara) and a new vice chair in Senator Andreas Borgeas (R-Fresno). Assembly Appropriations: Assemblywoman Lorena Gonzalez Fletcher (D-San Diego) remains as chair with Assemblyman Frank Bigelow (R-O’Neals) as vice chair. Assembly Communications & Conveyance Committee: Assemblyman Miguel Santiago (D-Los Angeles) remains as Chair with Assemblyman Jay Obernolte (R-Big Bear) as vice chair. Assembly Privacy & Consumer Protection: Assemblyman Ed Chau (D-Los Angeles) remains as Chair with Assemblyman Kevin Kiley (R-Granite Bay) continuing as the vice chair. Stay tuned …. more changes in the Administration as well. 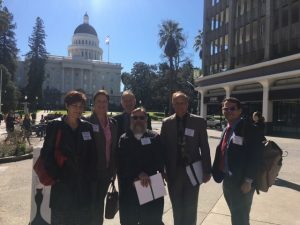 On April 27, 2016, CalCom held their Legislative Lobby Day at the Capitol. 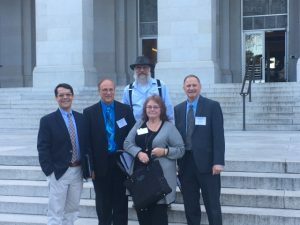 Thank you to all the member companies who sent representatives to Sacramento, including Sebastian, Cal-Ore Telephone, Ponderosa Telephone, Sierra Telephone, Siskiyou Telephone, Volcano Telephone and a few of our associate partners. It was a successful day! CalCom’s meetings were critical as there are many new members of the Legislature who work specifically on our issues and because of the committees they sit on should understand our industry and specifically our companies . 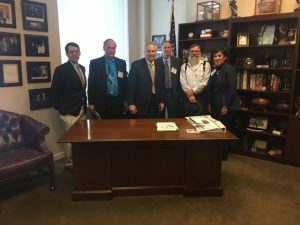 We had over eleven meetings with legislators and staff and had an opportunity to share CalCom company distinct operations and how we serve our customers and communities. One of the main issues being discussed at the Legislature is reform at the California Public Utilities Commission (CPUC). There are many legislative proposals that attempt to change the operations at the CPUC, including ACA 11 (Gatto), a Constitutional Amendment which would give authority to the State Legislature to revamp the CPUC and the functions that would remain in the oversight of the CPUC and what programs should and could be moved to other departments or agencies. ACA 11 has bi-partisan support and requires a 2/3 vote from the legislature. It looks like this could get passed and could be headed to the November ballot for a vote by the people of California. BS 1122 (Cannella) is a bill sponsored by CalCom which would codify the timeline for General Rate Cases set forth in the CPUC’s recent rulemaking of 13-14 months. The bill passed unanimously out of the Senate Energy, Utilities and Communications Committee and is set for hearing in the Senate Appropriations Committee for May 16, 2016. Assemblyman Frank Bigelow stopped by to spend time with the delegation as he was preparing to meet with Governor Brown on other issues. He expressed again how vital it is for CalCom companies to visit the Capitol and to have these events to focus on the issues impacting our members, and thanked us for being in Sacramento. For more information on policy issues impacting CalCom, please call our Lobbyist, Yolanda Benson at (916) 539-1125. SB 631 (Hueso) – PUC – Fees, would require a fee of $500 for filing these applications and would authorize the commission to adjust this fee based on the Consumer Price Index. There will undoubtedly be new bills introduced in 2016. The last day for introduction of new bills is February 19, 2016. It is not possible to predict the new bills that could impact CalCom members, however, we do know that Senator McGuire (D-Sonoma) will be introducing something as there have been several telecommunication outages in his district this past year. NEW LEADERSHIP: During the last few weeks of session in September, the Assembly Democrats elected a new leader to replace Assemblywoman Toni Atkins. It is expected during the first day of session on January 4, 2016 that the Assembly members will take a vote and elect Assemblyman Rendon officially as the new Speaker of the Assembly. The transition will be taking place in March. We are waiting to learn if the new Speaker upon election in January will name new chairs to policy committees and announce his leadership team. New leaders include Assemblyman Chad Mayes (R-Yucca Valley) will be replacing Assemblywoman Kristin Olsen (R-Modesto) as the new Republican Leader in the Assembly. Senator Jean Fuller (R-Bakersfield) is already in place as the new Senate Republican Leader. 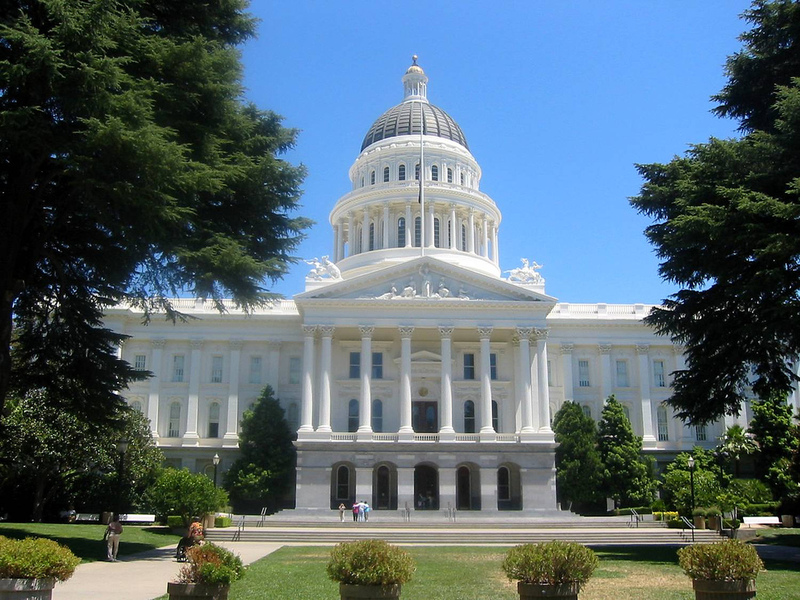 CalCom will continue to provide updates regarding the changes in leadership in the Legislature. MODERATE DEM CAUCUS: The Mod Dem Caucus have and will continue to play a very important role in the Legislature. In the past few years, they have become a force to be reckoned with on many legislative proposals and votes. In 2015, several “job killer” bills were stopped by the Moderate Democrat Caucus. The Mods were led by Assemblyman Henry Perea and they also worked to remove the 50% fossil fuel mandate in SB 350 (DeLeon) as the Mods were not going to vote for SB 350 with that provision in the bill. The Mods also stopped other bills regarding taxes, wages, fees and other bills that were controversial which negatively impacted the business community. 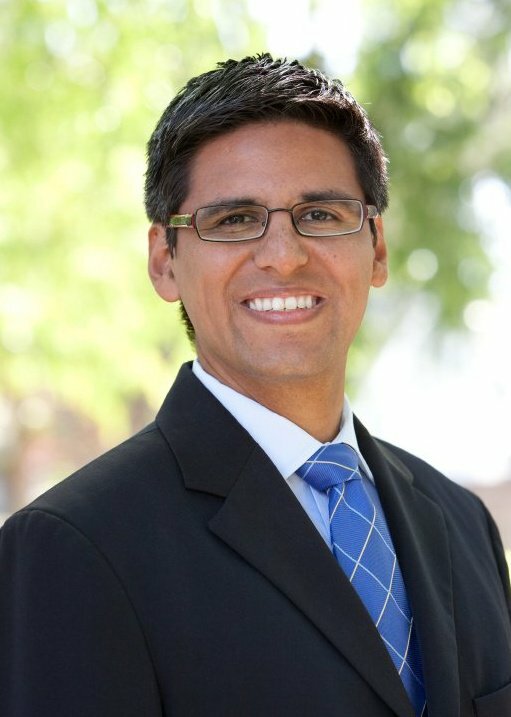 On December 1, 2015, Assemblyman Henry Perea, a moderate Democrat from the Central Valle, announced that he was resigning and not finishing his term (ending 2016). He officially is leaving office on December 31, 2015. This left the position of leader of the moderate Dem Caucus (Blue Dogs) in question. On December 8, 2015, the Mod Caucus at their retreat in Torrey Pines elected Assemblyman Jim Cooper (D-Elk Grove) and Assemblyman Rudy Salas (D-Hanford) who will be joint leaders. Election year: New ideas are not yet known of what labor groups will be looking to accomplish in 2016. With 2016 being an election year no doubt labor will put their stake in the ground to mark the territory of importance. The “asks” from labor will be big because of the political dynamics of an election year. Additionally, there will be many close democrat vs. democrat races. No doubt there will be “labor” candidates running in the same districts as “business friendly” or moderate candidates. The political dynamics will play a role with legislators currently in office today looking to run for other elected offices. Ballot Initiatives: Other priorities for labor will include several ballot initiatives. Some of the issues will impact taxes, including a tobacco tax, extending Proposition 30 and raising the minimum wage. The SEIU has tried several times to pass a legislative proposal regarding the minimum wage and they have not been successful, therefore, because the legislature can’t solve their problem so they are going to the ballot. As of the end of November 19 initiatives have been approved for the November 2016 ballot. Additionally, 47 more have cleared, 7 have failed and 45 are pending summary. The ballot will also include some other education and infrastructure bond measures that will be of interest of various labor groups. CalCom is honoring Assemblyman Henry T. Perea with the Legislator of the Year Award in recognition of his efforts last session to reform the California Public Utilities Commission’s process for approving company investments in broadband capable facilities. 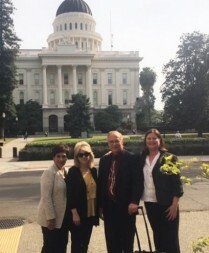 On March 24, 2015, several of our CalCom members traveled to Sacramento for CalCom’s Legislative Day at the State Capitol. With over two-thirds of the Legislature being new, it was important to bring our unique issues before many of the new staff, legislators and policy consultants. The day started at 8:30 a.m. with our first meeting at 9:00 a.m. We met with over eleven offices, including a meeting with newly elected Assemblyman Jim Wood, Chair of the Select Committee on the Digital Divide in Rural California, who has introduced legislation regarding deployment of broadband to rural California (AB 1262). CalCom members also met with Assemblyman Anthony Rendon, the new Chair of the Assembly Utilities and Commerce Committee, who also has legislation that would deal with rural broadband issues and reform at the California Public Utilities Commission. In addition, to meeting with many of the members of the Assembly Utilities and Commerce Committee, we met with newly elected member, Assemblyman David Hadley, representing South LA County, who, interestingly, has a background working on telecommunications issues. This day gave CalCom a great opportunity to provide an education about our member companies and explain our role in the delivery of communications services in rural California. We also had a few opportunities to explain the difficult regulatory environment in which we operate and demonstrate the distinction of our members. Thank you to all who participated in CalCom’s Legislative Day! Election Results: On November 4, 2014, a statewide election was held. The election brought many changes to the California State Legislature. First, the Republicans took advantage of a traditional dip in mid-term election turnout and gained seats in both the Assembly and the Senate to end Democrats supermajorities in both houses. With the new open primary, there were twelve seats where a Democrat was running against a Democrat and five seats where Republicans were running against another Republican. The biggest surprise was Democrat Raul Bocanegra losing to a political unknown Patty Lopez. Bocanegra was in line to be an integral part of the leadership in the Assembly. An interesting tidbit is that out of 39 city and county officials who ran for state office, 24 won their elections. There were 62% Democrats who ran for office to only 37% Republicans running for office. Of those running for office, 20% were Asian Pacific Islander and 16% were either African American or Latino. What to Expect in 2015: The 2014 Legislative Session ended a two-year legislative session (2013-2014). On January 5, 2015 a new two-year session will begin (2015-2016). On December 1, 2014 all members of the State Legislature were sworn into office. There are many new faces as over 27 new members joined the State Legislature. It looks like many business-friendly Democrats were voted into office as well and as mentioned, no supermajorities in any house. The real importance of the supermajorities is that while the budget can be approved and passed with a simple majority, it requires two-thirds vote to raise taxes. Tax changes are bound to be part of the discussion in Sacramento in this new session. Newly elected Senator Bob Hertzberg has already introduced a bill to bring that discussion forward (SB 8) introduced on December 1, 2014. The CalCom lobbying team will be bringing these and other issues to your attention as they occur in Sacramento. It should be a very interesting year.